Being one of Lincrusta’s leading installers, I have worked throughout the Far East, Middle East and Europe for CVW Ltd. (Lincrusta’s owners)… working in these different Geographic Markets, I have experienced at first hand the incredible width and breadth of products available to the Decorator; there are so many products claiming to be the “one and only” and “ultimate”. It really is quite mesmerising. I get many emails asking for advice about how to install and restore Lincrusta. But it seems a trend in North America, particularly, to ask about which adhesives to use other than Lincrusta’s RDADH10 – (pictured above), or the previously produced LG100 product. 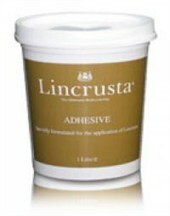 It seems that Clay Based or Vinyl on Vinyl adhesives are the way that this Market wants to go… My enquirers all seem to ask if they have to use Lincrusta’s adhesive. “Lincrusta is the ultimate wallcovering used in some of the most prestigious buildings and locations around the world since it was first invented in 1877. Lincrusta is unique in the home and commercial decorations markets – there’s simply nothing quite like it for classical style and durability. Lincrusta is made today from natural materials in exactly the same way as 1877, even using the same designs and, in some cases, the original rollers. Lincrusta is a perfect solution for today’s interior designers, specifiers and architects as it offers innovative solutions for any design application. This entry was posted in Uncategorized on October 28, 2012 by mjguestltdblog.